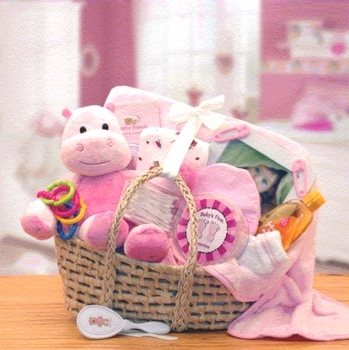 Our baby girl celebration gift basket is a terrific gift to herald the new girl's birth! The proud parents are certainly going to use all the necessities and timeless keepsakes found in this gorgeous moses basket. This large basket measures 14 inches by 12 inches and weighs a full 5 pounds! Johnson�s Baby Shampoo 4 oz. This beautiful presentation will make quite an impression at the baby shower and it also is a fun and useful present to welcome everyone home from the hospital! Note: Plush animal assortment, towels, blankets and clothing designs can vary and may not all be identical to the photo.